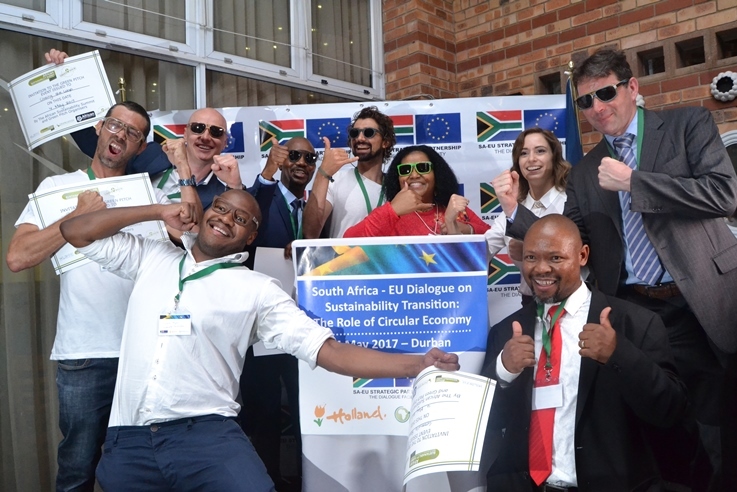 Sometimes a picture can say more than a thousand words: South Africa’s Environmental Minister Mrs. Edna Molewa, MD Acceleratio Mr. Freek van Eijk and Ms. Bernice Robbertse from Blank Canvas surrounded by start-ups at the EU-South Africa-NL conference on Circular Economy in Durban. They all enjoy and are wearing Sk8Shades sunglasses made from used skateboards. Together with Astrid Schomaker, director for global sustainable development with the European Commission’s directorate-general for environment, Acceleratio’s Managing Director Acceleratio Freek van Eijk wrote an article in South Africa’s leading newspaper BusinessDay on April 28, 2017. They introduced the topic of Circular Economy, shared examples and quantified benefits. While SA and the EU will find different ways to move towards a circular economy, there is wide scope for the two strategic partners to collaborate. A more extended version of the article can be found on Linkedin.